Toffee: butter small rimmed baking sheet. Combine nuts and baking soda in a small bowl. Stir sugar, water and butter in a heavy small saucepan over medium heat until sugar dissolves and butter melts, about 2 minutes. Increase heat to medium-high. Boil until dark amber colored, stirring constantly, about 3 minutes. Mix in nut mixture and immediately pour it onto buttered sheet, spreading it as much as possible. Cool completely, then chop with a sharp knife into small pieces. Ice cream: bring cream, milk and salt to a simmer in a heavy large saucepan. Whisk sugar and egg yolks in a medium bowl. Gradually whisk hot cream mixture into yolk mixture. Return mixture to same saucepan. Stir over medium-low heat until custard thickens and leaves path on back of spoon when finger is drawn across – do not boil. Pass through a sieve into a medium bowl, stir in vanilla and refrigerate until very cold, 3-4 hours. Process custard into ice cream maker according to manufactures’ instructions. Add toffee during last 5 minutes of churning. Transfer to an ice cream container, cover and freeze until firm. Great post !! I love your ice cream ! First, I love your polka dot ice cream cups. Second, the ice cream sounds to-die-for! Have a great weekend! May I confess that I work as a pastry chef in an ice cream and candy shop and that, although you'd think I'd be tired of ice cream by now, I can't wait to try this recipe! 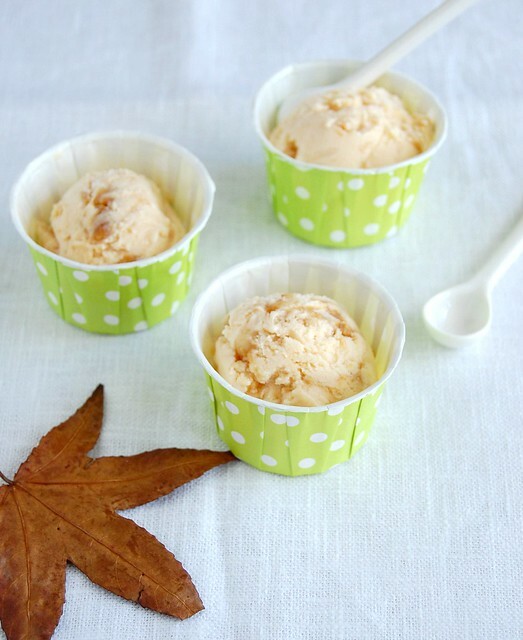 I loooooove macadamia nuts-- I think their sweet nuttiness would be so delicious in a frozen treat! Wow, love the flavors in this ice cream. Beautiful pics and thos cups are so cute! How can you not have "baking: from my home to yours" in your list?!?! I don't have any of those books and some look REALLY interesting! This makes me really wonder why I don't yet own The Perfect Scoop (I love his website and ice creams from there)! How I love macadamia nuts and praline--this will end up in my ice cream maker at some point this summer. Argone, the ingredients are listed in cups. You're welcome! Cozy Herbivore, I'm glad you like it! I personally think the peanuts would be fabulous here, too. Cookin'Oz, thank you for your kind words! I have that book on my wish list, it's great to know you like it - tks!